Hey look, it's the very first full-length Lego movie. Directed by Phil Lord and Chris Miller. Fun fact, Miller's personal Lego set from his childhood will be used in the movie. TT Games is also making a The Lego Movie Videogame to be release alongside the movie for every game system known to mankind. 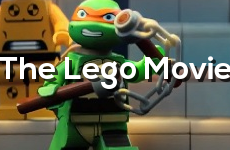 Here are some fun screenshots of just some of the characters you'll be seeing in The Lego movie. Charlie Day from It's Always Sunny in Philadelphia voices 1980-something Space Guy. Also known as Benny the Space Guy. Also, his helmet is broken. Here's the hero of the movie, Emmet. He's always happy to pay 37 dollars for a cup of coffee. Yup, definitely not the Master Builder they were looking for. The bad guy of the movie is known as Lord Business, played by Will Ferrell. Channing Tatum... I don't like that guy. He's too muscular and his voice doesn't even fit Superman. What is going on here?! Of course we have Morgan Freeman voicing the god-like character.